That is a Clanger. What are they? Space mice? They live on a small, blue moon that is quite barren on the surface (apart from the music tree). They are very civilized and live in a large cave. The cave is covered by a big, metal saucepan like lid to protect them from meteorites and interesting falling debris. The cave has very small rooms off it where Major Clanger, Mother Clanger, Granny Clanger, Small Clanger and Tiny Clanger each sleep. 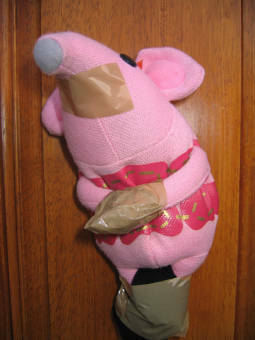 Poor Tiny Clanger was subjected to a horrific ordeal at the hands of a psychopath! Through her cunning and minxiness, she managed to escape unharmed... phew! 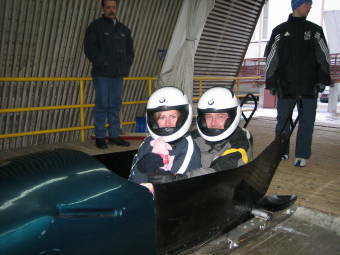 Feel the passion, feel the pride, c'mon Clanger it's bobsleigh time - Cool runnings!